Growing up in the idyllic U.S. Virgin Islands, Jasmine Campbell remembers commuting to school every morning by ferry boat from her home on the island of St. John over to school on St. Thomas Island, a trip of about 20 minutes. The 22-year-old Hailey resident took a longer trip Wednesday from Sun Valley to Sochi, Russia where she will be the only U.S. Virgin Islands representative in the 2014 Winter Olympics. Campbell will carry the Virgin Islands flag in today’s opening ceremony at Fisht Olympic Stadium. Campbell, a native of St. John whose family moved to the Wood River Valley when she was nine, is a Whitman College (Walla Walla, Wash.) junior taking a gap year to focus on qualifying for and competing in the Olympics. She plans compete in the Feb. 18 giant slalom and Feb. 21 slalom. Jasmine, known as “Jazz,” in her freshman and sophomore years studying at the Community School in Sun Valley, said she was very excited that her father John will be able to attend the Sochi Winter Olympics as her coach. Campbell was three months old when John Campbell competed for the Virgin Islands in slalom, giant slalom and super giant slalom at the 1992 Winter Olympics in Albertville, Fra. Her mother Jen was also a high-level alpine ski racer and would have accompanied her husband to Albertville 22 years ago if not for her family responsibilities. Jasmine is the U.S. Virgin Islands’ first Olympic qualifier in women’s alpine skiing since 1988. Her goals in Sochi? She said, “I will be going to the Olympics trying to ski my personal fastest, my personal strongest and my personal best. That is all I can really hope to do. “The Olympics are also about bringing the world together in a community of sport and human excellence. It’s a time to transcend beyond differences and divisiveness. Most of Jasmine’s training as a young athlete was with the Hailey Ski Team, for six years. 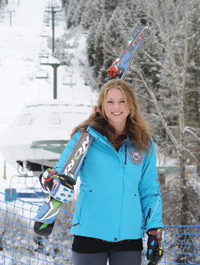 She raced with the Sun Valley Ski Education Foundation for a year in high school, and with SVSEF for the last two years when training for the Olympics, her father said. She attended the Community School as a freshman and sophomore. At one time, when she was a ninth grader, the Sun Valley independent school welcomed the entire Campbell family of siblings including then-senior Ross Campbell and junior Ryon Campbell. Having two older brothers has always kept Jasmine on her toes. Take, for instance, her training for the Olympics. She said, “My training sessions occurred five to six days a week barring races. When I had on-snow training available, I generally had two daily ski sessions, two hours each, focusing on either GS or slalom. I then went to the gym for some strength training or stretching. “If my brothers were in town the gym was replaced by more or less ‘combat’ hockey, which they insisted was vital for cross-training benefits. She credits time spent with Sun Valley native Hailey Duke, like Jasmine an independent ski racer, and to Virgin Islands people like Yuri Gaspar (“he’s been absolutely invaluable in helping me in the process,” she said). The SVSEF coaches have been invaluable as well, she said. Jasmine has done a lot herself, and grown as a person. Campbell said, “Although I received a great deal of assistance from ski programs like Sun Valley Ski Academy, I have also needed to act as my own coach and trainer for a great deal of time. “My father’s journey to the Olympics carved a path very different from mine, so I’m not sure I would say I followed in his footsteps. My dad was a father of three and living full time in the Virgin Islands, and the qualification standards were quite different. She has fond recollections of a Virgin Islands childhood.